Citation: Dong H, Wu H, Zhao J, et al. Glutamine enhances protein content by the mTOR pathway in electrical stimulated C2C12 myotubes. Arch Gen Intern Med. 2018;2(1):41-46. An impressive 40%-50% of the body consists of skeletal muscles, which have a very important role in maintaining quality of life. Proteins are constantly being synthesized and degraded in these tissues , which becomes more complicated when the body is engaged in exercise . Many factors affect this process, including exercise and the nutritional supplementation [3-5]. The influence of exercise on skeletal muscle function has always been a significant topic for discussion in the field of sports medicine research, prompting the need for more studies about different types of exercises. Glutamine is synthesized mainly in skeletal muscle and is the most abundant conditioned essential amino acid [6-9]. When athletes are exercising or training, reasonable supplementation of glutamine is very important for improving motor function. However, the body only requires a limited amount of glutamine. Too much supplementation can cause excessive metabolism, increasing the burden of the liver. At present, the key to supplementing glutamine is the determination of dose under different conditions and at different times. The mTOR pathway is the main metabolic regulator of skeletal muscle protein synthesis. Both appropriate exercise and glutamine supplementation can promote protein synthesis, but the mechanisms of action are still not completely clear. Moreover, there has been very little research into the relationship between glutamine supplementation and the mTOR pathway. Our experimental scheme involved using electrical stimulus (15v, 30ms, 3Hz, 90 min) and glutamine supplementation (10 mM, 48 h), culminating in the detection of the total protein content and expression of mTOR/S6K1 mRNA and p-S6/MHC protein. Consequently, this method researched the effects of electrical stimulation and glutamine supplementation on protein content and the mTOR pathway, as well as provided a theoretical basis for sports injury and recovery. C2C12 cells were cultured in growth medium containing 4.5 g/l glucose, 4 mM glutamine, 10% FBS, 100 ug/ml penicillin, and 50 ug/ml streptomycin at 37°C under a 5% CO2 atmosphere. Cells were then plated on 35 mm culture dishes at a density of 2 × 105 cells/well in 2 ml of growth medium. Three days after plating, the cells had reached 90%-95% confluence (day 0). Differentiation was induced by incubating cells in differentiation medium containing 4.5 g/l glucose, 4 mM Glutamine, 2% HS, 100 ug/ml penicillin, and 50 ug/ml streptomycin. The differentiation medium was changed every 24 h. On differentiation day 5, cultures were divided into two groups: the control group, which was incubated in the previously described differentiation medium for 48 h, and the glutamine group, which was incubated in a separate differentiation medium containing 10 mM glutamine for 48 h.
We used custom built electrodes made of 1 mm platinum wire for electrical stimulation of the C2C12 myotubes. Two half-circle electrodes were aligned to the side of the well, in order to obtain a maximal area of stimulation. At first, platinum wire electrodes were sterilized with 70% ethanol and subsequently dried under ultraviolet light. Differentiated C2C12 myotubes were given one electrical stimulation exposure (15V, 3Hz, 30ms, 90 mins, Grass S-48 stimulator). The control group was divided into two groups, Con (without electrical stimulation) and Es (with electrical stimulation). The glutamine group was also divided into Gln (without electrical stimulation) and Gln+Es (with electrical stimulation). After electrical stimulation, samples of Es and Gln+Es were harvested at 0, 6, 18, and 24 hours. Given the harvest times, Es had four groups, Es0, Es6, Es18, and Es24. Gln+Es were subdivided into Gln+Es0, Gln+Es6, Gln+Es18, and Gln+Es24. In brief, the supernatant was removed and the cells were washed twice with cold PBS. RIPA pyrolysis liquid (200 μl/well) was then used for 30 minutes above ice at 4°C, centrifuged (12000 g, 10 min), and the supernatant was removed. The BCA Protein Assay Kit was then used to measure total protein concentration (μg/cm2). Total RNA was extracted from C2C12 myotubes using the PrimeScriptTM RT reagent Kit, according to the manufacturer’s instructions. The reaction conditions were 37°C for 15 min, 85°C for 5s, and 4°C for 30 min. The cDNAs corresponding to various genes were amplified using the SYBR premix Ex Taq II and quantified at 95°C for 3 min, followed by 45 cycles of 95°C for 5s, 60°C for 25s, and 72°C for 30s, ending with 72°C for 5 min. mTOR forward was 5'- ATGGCGGATGATCTAAAGCGA -3'; mTOR reverse was 5'- GGCACTGTCGTTAGCCACT -3'. S6K1 forward was 5'- CCATCACACACCACGTCAAG -3'; S6K1 reverse was 5'- TTGCGTACCAGGAAGACTTTG -3'. All samples were analyzed at least three times. The expression of each transcript was measured by the 2-ΔΔCt method, using the threshold cycle (Ct) value. GAPDH transcription was used as an internal control. The amplification of specific transcripts was further confirmed by melting curve analysis. 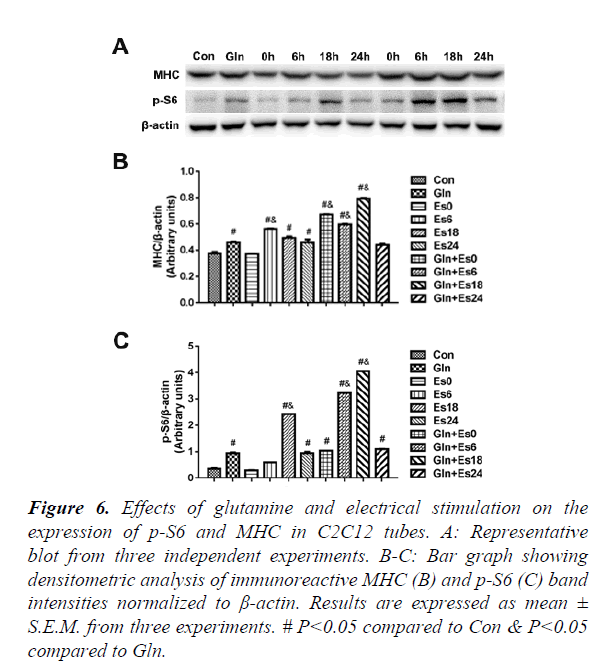 The presence of p-S6 and MHC proteins in the C2C12 cells after glutamine incubation and electrical stimulation was detected by Western blot. Briefly, cells were washed with cold phosphate buffer saline (PBS) and directly lysed with Laemmli sample buffer. The samples were then run on 6% SDS-PAGE, followed by transfer to a nitrocellulose membrane (Bio-Rad-USA). The membrane was blocked for 1.5h at room temperature with 5% BSA and 0.05% Tween-20 in phosphate buffer saline. Next, the membrane was incubated with anti-MHC (1:1000, proteintech, 10799-1-AP), anti-p-S6K1 (1:2000, CST, 9204S), or anti-β- actin (1:1000, Santa Cruz Biotechnology Inc) overnight at 4°C. The membrane was washed and incubated with rabbit-peroxidase- conjugated secondary antibody at room temperature for 2 h and the immune-reactive bands were visualized using a chemi-luminescence detection system (Imuno-Star, Bio-Rad). Relative band intensity was quantified using Image J software after normalizing with β-actin band intensity. SPSS software, version 16.0, was used to analyze all dates presented as means and standard deviation (M ± SD). One-way ANOVA and Tukey’s post hoc tests were carried out to determine the differences in several time points and two different conditions. Two-way ANOVA were carried out to determine the differences between time and treatment effects. P<0.05 was considered statistically significant. Our study required differentiated C2C12 myotubes, in order to ensure stability during experimentation. From days 1 to 7, the protein content increased significantly, compared with that of the previous day (P<0.05) (Figure 1A). To observe the myotube states, we took photos of different days (Figure 1B). On day 0, there were no myotubes present. On day 1, there were a few small myotubes. Days 3 and 5, showed many big myotubes and on days 7 and 9, the myotubes were much longer and thicker than the previous days. There was no difference between days 7 and 9. We therefore decided to add glutamine after 5 days of differentiation. *denotes a significant difference between the previous day and the day after (P<0.05). Figure 1. 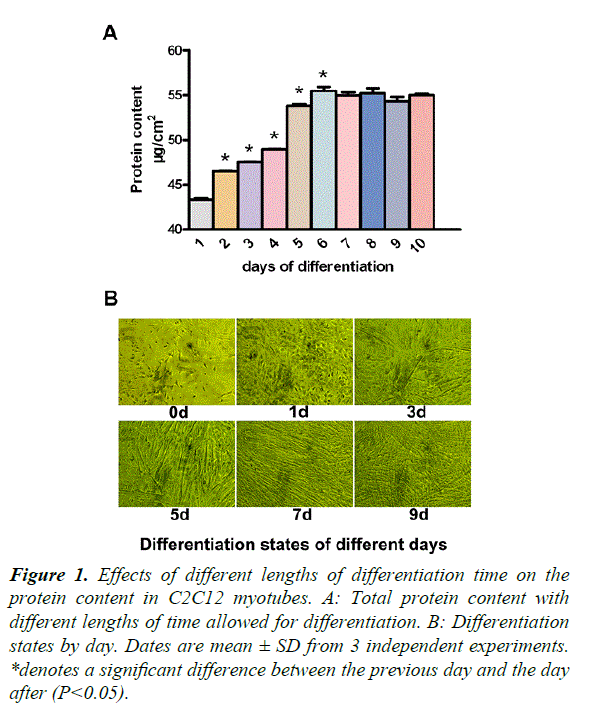 Effects of different lengths of differentiation time on the protein content in C2C12 myotubes. A: Total protein content with different lengths of time allowed for differentiation. B: Differentiation states by day. Dates are mean ± SD from 3 independent experiments. Generally, our culture medium had 4 mM glutamine, but we needed to increase the concentration of glutamine, which has high protein content. Results showed that, when comparing protein content, from 0 mM to 20 mM, the 4 mM, 2 mM, and 0 mM groups decreased significantly (P<0.05/0.01), and the 10 mM group increased significantly (P<0.05). So we decided to add the glutamine in a concentration of 10 mM (Figure 2). *denotes a significant difference compared to 4 mM (P<0.05). Figure 2. 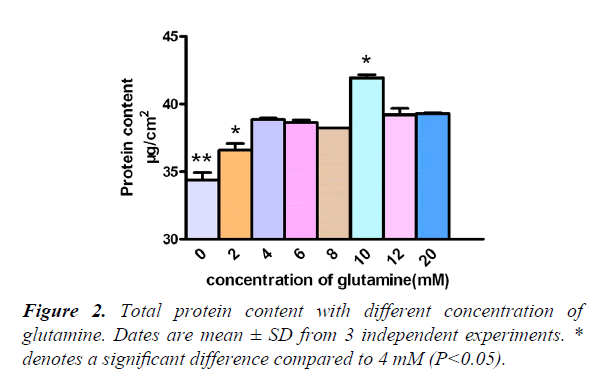 Total protein content with different concentration of glutamine. Dates are mean ± SD from 3 independent experiments. Protein metabolism includes both synthesis and degeneration and the mTOR pathway plays a large role in this process. The total protein content of Gln cells was greater than that of the Con (P<0.05). Glutamine supplementation was shown to promote protein synthesis and inhibit degeneration, which was consistent with the results of previous studies [1-10]. Compared with the protein content of Con, that of Es6 decreased significantly (P<0.01), but Es18 and Es24 were found have significantly increased (P<0.01). The trend of changing protein content in Es was similarly observed in Gln+Es, but the overall level was higher in the latter. Gln+Es6 was also significantly higher than Es 6 (P<0.05) (Figure 3). This demonstrates that glutamine supplementation can help to maintain and encourage the growth of C2C12 myotubes followed by electrical stimulation. #denotes a significant difference compared with the control treatment (P<0.05). *denotes a significant difference between Es and Gln+Es at the same hour point (P<0.05). Figure 3. Effects of Glutamine and Electrical Stimulation on the protein content in C2C12 myotubes. Dates are mean ± SD from 3 independent experiments. mTOR is obviously an essential factor in the mTOR signaling pathway. In order to observe the expression of mTOR mRNA in our research, we used RT-PCR and showed the melt curve analysis and amplification results (Figure 4A-C). We then quantified the values with the 2-ΔΔCt method. Results showed that the expression of mTOR mRNA in the Gln group was higher than that of in Con (P<0.05). Es0 and Es6 results were similar to Con, but Es6 had higher levels of mTOR mRNA than Es0 (P<0.05). However, Es18 had significantly higher levels than Con (P<0.01). The Gln+Es group showed similar results to the expression of mTOR mRNA in Es. An initial decline was followed by a subsequent rise. The difference was that in Es, the peak occurred within 18 h after electrical stimulation, but in Gln+Es, it was within 6 h (Figure 4D). This showed that glutamine supplementation increases the rate of expression of mTOR mRNA after electrical stimulation in C2C12 myotubes. #denotes a significant difference compared with the control (P<0.05). Figure 4. 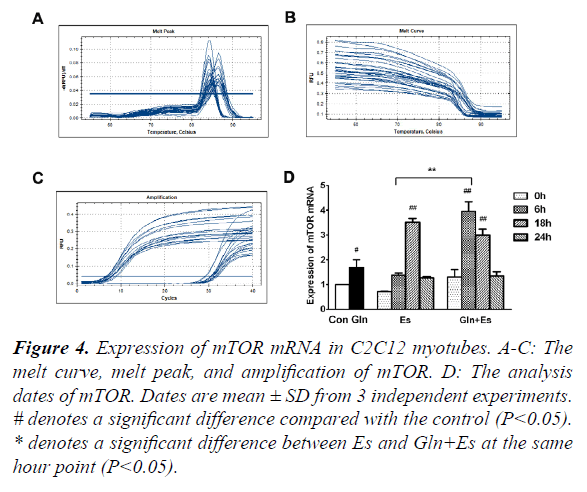 Expression of mTOR mRNA in C2C12 myotubes. A-C: The melt curve, melt peak, and amplification of mTOR. D: The analysis dates of mTOR. Dates are mean ± SD from 3 independent experiments. S6k1 is an important signaling factor downstream in the mTOR pathway. To observe the expression of S6K1 mRNA in our research, we used RT-PCR and showed the melt curve analysis and amplification results (Figure 5A-C). We then quantified the values with the 2-ΔΔ Ct method. Results showed that the expression of S6K1 mRNA in Gln and Es6 were higher than in Con (P<0.05). When compared with the expression of Es S6K1 mRNA, Gln+Es showed a similar trend, which was also an initial decline followed by a rise, the overall level of Gln+Es being higher (Figure 5D). This showed that glutamine supplementation increased the expression of S6K1 mRNA in C2C12 myotubes after electrical stimulation. Figure 5. Expression of S6k1 mRNA in C2C12 myotubes. A-C: The melt curve, melt peak, and amplification of S6k1. D: The analysis dates of S6k1. Dates are mean ± SD from 3 independent experiments. In order to further observe the downstream of mTOR and the expression of contractile proteins, we used the western blot to indicate the p-S6 and MHC (Figure 6A) and quantified the results (Figure 6B and C), which showed that the changes in p-S6 were similar to the changes of mTOR. The MHC changed stablely. This showed that glutamine supplementation promoted MHC by mTOR passway in C2C12 myotubes after electrical stimulation. #P<0.05 compared to Con & P<0.05 compared to Gln. Figure 6. Effects of glutamine and electrical stimulation on the expression of p-S6 and MHC in C2C12 tubes. A: Representative blot from three independent experiments. B-C: Bar graph showing densitometric analysis of immunoreactive MHC (B) and p-S6 (C) band intensities normalized to β-actin. Results are expressed as mean ± S.E.M. from three experiments. A great quantity of energy is consumed in skeletal muscle during exercise. Excise strain can result in the functional disorder of normal membranes and an increase in protein metabolism . As time goes on, the total protein content increases. In long-duration and high intensity exercise, the muscle stretching and overload leads to the degradation of muscle protein and a negative balance of nitrogen. Glutamine is an important carrier of the nitrogen flow and a precursor to protein synthesis. When the body synthesis of glutamine cannot meet its own needs, exogenous glutamine supplementation should be used as and when required [11,12]. Consequently, exogenous glutamine plays a very important role in maintaining normal function during exercise. Our conclusion, which is consistent with many others, is that glutamine can promote protein synthesis and inhibit protein degradation [13-16]. At this point, amino acids function, not only as a substrate for newly synthesized protein, but also as a “trigger” (signaling molecule) for the initiation of protein synthesis . It has recently been shown that glutamine may have a positive influence on the downstream protein synthesis in mTOR activation in a HeLa cell model [18,19]. However, the precise role played by glutamine in regulating the skeletal muscle mass is not fully understood. The mechanism by which muscle contraction affects the mTOR pathway is also unclear [20,21]. In our study, total protein concentration in Gln was greater than seen in Con, which showed that glutamine supplementation could promote protein synthesis and inhibit protein decomposition. Additional electrical stimulate immediately induced degradation of skeletal muscle protein, 18 h later the cells began to recover and homeostasis was restored. Notably, the protein content of Gln+Es6 was significantly higher than Es6. This suggests that glutamine supplementation maintains and increases the activity of C2C12 myotubes after electrical stimulation. When the body undergoes high intensity exercise for a long time, muscle movement deformation and overload causes an increase in muscle protein degradation and a negative nitrogen balance. Because the glutamine precursor is an important carrier of the nitrogen flow and protein synthesis, exogenous glutamine should be supplemented when the body’s own synthesis of glutamine cannot keep up with its needs. Therefore, glutamine supplementation is important for the exercising body to maintain normal function. Similar to protein concentration, the Gln expression of mTOR and p-S6 had similar trends, which was a decline in protein followed by a subsequent rise. 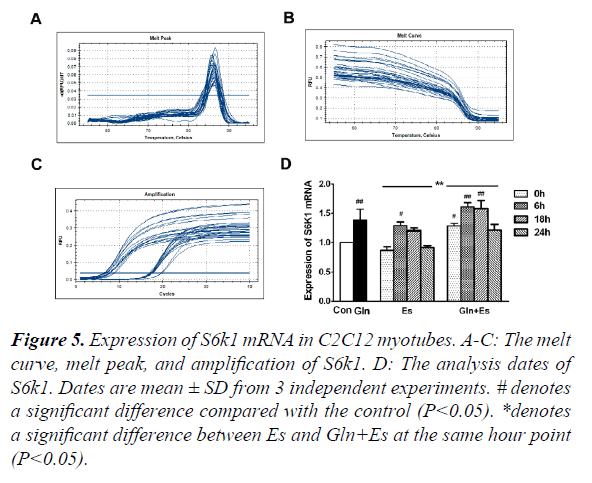 The difference was that Es reached the peak in 18 hours, while Gln+Es did so in 6 h. This showed that glutamine supplementation might stimulate an earlier expression of mTOR and p-S6 in C2C12 myotubes after electrical stimulation. Amino acids are necessary as a precursor for protein synthesis, but they can also be used as signaling and regulating factors in protein metabolism, such as when they are used as ingredients of mRNA expression. The acting mechanism of the mTOR pathway on muscle contraction is unclear. Many factors may be associated, such as hormones, calcium ion content, mechanical contraction-electric, local hypoxia and nutritional status . Studies have shown that a mixed solution of EAA + CHO further strengthened the mTOR signaling pathway during the recovery period of exercise, and led to increased muscle protein synthesis . Clearly, exercise combined with proper nutrition enhances the effects of the mTOR pathway. MHC is closely related to skeletal muscle contractility and myosin ATP enzyme activity. Many studies [24,25] have failed to elucidate when exactly MHC significantly changes after exercise. MHC generated similar maximal Ca2+ activated force and cardiac contractile activation differently through modifications of myofilament proteins [26-28]. The MHC expression in both Es and Gln+Es changed stable with a similar trend, decline followed by rise. This showed that glutamine supplementation might increase MHC expression by mTOR passway in C2C12 myotubes after electrical stimulation. These results suggest that electrical stimulation is required for this particular glutamine-mediated event in the protein synthesis pathway. It is very important for athletes to intake reasonable amounts of glutamine during sports training, but the body does have a limit, above which excessive glutamine metabolism may increase the burden of liver metabolism [29,30]. Currently, the key research finding of these studies is that the dose and timing of glutamine supplementation vary by case. Our study showed that both glutamine exposure alone and electrical stimulation alone significantly increased protein content and the expression of mTOR and MHC in C2C12 muscle tubes. Glutamine and electrical stimulation may promote C2C12 muscle protein synthesis by the mTOR pathway, which promotes muscle recovery. Glutamine combined with electrical stimulation further increased protein content, mTOR expression reached an earlier peak, and MHC expression remained stable at a high level. We can see that glutamine combined with electrical stimulation further promoted C2C12 muscle protein synthesis and recovery by the mTOR pathway. Glutamine affects mTOR expression via the mTOR pathway, which further affects p-S6 and MHC expression. However, glutamine is probably also influencing MHC gene expression by other pathways. Therefore, more research is needed to elucidate these mechanisms of action. Guangdong Natural Science Foundation (2017A030310178); Educational and Teaching Reform Subject in Universities of China (82617058). Andrews FJ, Griffiths RD. Glutamine: essential for immune nutrition in the critically ill. Br J Nutr. 2002;87:S3-S8. Candow DG, Chilibeck PD, Burke DG, et al. Effect of glutamine supplementation combined with resistance training in young adults. Eur J Appl Physiol. 2001;86:142-9. Mascher H, Andersson H, Nilsson PA, et al. Changes in signaling pathways regulating protein synthesis in human muscle in the recovery period after endurance exercise. Acta Physiol (Oxf). 2007;191(1):67-75. Wooten. Resistance Exercise and Lipoproteins in Postmenopausal Women. Int J Sports Med. 2011;32(1):7-13. Adam J. Regulatory mechanisms of skeletal muscle protein turnover during exercise. J Appl Physiol. 2009;106:1702-11. Yeh SL, Lai YN, Shang HF, et al. Effects of glutamine supplementation on innate immune response in rats with gut derived sepsis. Br J Nutr. 2004;91(3):423-9. Lai YN, Yeh SL, LinMT, et al. Glutamine supplementation enhances mucosal immunity in rats with gut2 derived sepsis. J Nutrition. 2004;20(3):286-91. Jung SE, Youn YK, Lim YS, et al. Combined administration of glutamine and growth hormone synergistically reduces bacterial translocation in sepsis. J Korean Med Sci. 2003;18(1):17-22. Chiolero RL, BergerMM. Imp roving nutritional support in critically Ill septic patients: glutamine alone or in combination? J Nutrition. 2002;18(9):723-4. Xiangbing Mao. Leucine promotes leptin receptor expression in mouse C2C12 myotubes through the mTOR pathway. Mol Biol Rep. 2011;38:3201-6. Neu J, DeMarco V, LiN, et al. Glutamine: clinical app lications and mechanisms of action. Curr in Clin Nutr Metab Care. 2002;5(1):69-75. Sonia Métayer, Iban Seiliez, Anne Collin. Mechanisms through which sulfur amino acids control protein metabolism and oxidative status. The J Nutritional Biochem. 2008;19(4):207-15. Christina H Eng. Ammonia Derived from Glutaminolysis Is a Diffusible Regulator of Autophagy. Science Signaling. 2010;3(119). Paul Nicklin. Bidirectional Transport of Amino Acids Regulates mTOR and Autophagy. Cell. 2009;136(6):521-34. Tokunaga C. mTOR integrates amino acid- and energy-sensing pathways. Biochemical and Biophysical Research Communications. 313(2004):443-6. Pazit Polak, Michael N Hall. mTOR and the control of whole body metabolism. Current Opinion in Cell Biology. 2009;21:209-18. Wackerhage H, Rennie MJ. How nutrition and exercise musculoskeletal mass. J Anat. 2006;208:451-8. Talvas J, Obled A, Fafournoux P, et al. Regulation of protein synthesis by leucine starvation involves distinct mechanisms in mouse C2C12 myoblasts and myotubes. J Nutr. 2006;136(6):1466-71. Nicklin P, Bergman P, Zhang B, et al. Bidirectional transport of amino acids regulates mTOR and autophagy. Cell. 2009;136:521-34. Hu SY, Tai CC, Li YH, et al. Progranulin compensates for blocked IGF-1 signaling to promote myotube hypertrophy in C2C12 myoblasts via the PI3K/Akt/mTOR pathway. FEBS Lett. 2012;586(19):3485-92. Li M, Verdijk LB, Sakamoto K, et al. Reduced AMPK-ACC and mTOR signaling in muscle from older men, and effect of resistance exercise. Mech Ageing Dev. 2012;133(11-12):655-64. Ogasawara R, Kobayashi K, Tsutaki A, et al. mTOR signaling response to resistance exercise is altered by chronic resistance training and detraining in skeletal muscle. J Appl Physiol. 2013;114(7):934-40. Dreyer HC, Drummond MJ, Pennings B, et al. Leucine-enriched essential amino acid and carbohydrate ingestion following resistance exercise enhances mTOR signaling and protein synthesis in human muscle. Am J Physiol Endocrinol Metab. 2008;294(2): E392-400. Liu Y, Schlumberger A, Wirth K, et al. Differenteffects on human skeletal myosin heavy chain isoform expression: strength vs. combination training. J Appl Physiol. 2003;94(6):2282-8. Willoughby DS, Rosene JM. Effects of oral creatine and resistance training on myosin heavy chain expression. Med Sci Sports Exerc; 2001;33(10):1674-81. Herron TJ, Korte FS, McDonald KS. Loaded shortening and power output in cardiac myocytes are dependent on myosin heavy chain isoform expression. Am J Physiol Heart Circ Physiol. 2001;281:H1217-22. Rundell VL, Manaves V, Martin AF, et al. Impact of betamyosin heavy chain isoform expression on cross-bridge cycling kinetics. Am J Physiol Heart Circ Physiol. 2005;288:H896-903. Vutthasathien P, Wattanapermpool J. Regular exercise improves cardiac contractile activation by modulating MHC isoforms and SERCA activity in orchidectomized rats. J Appl Physiol. 2015; 119:831-9. Rundqvist HC, Lilja MR, Rooyackers O, et al. Nutrient ingestion increased mTOR signaling, but not hVps34 activity in human skeletal muscle after sprint exercise. Physiol Rep. 2013;1(5):e00076. Wang DT, Yin Y, Yang YJ, et al. Resveratrol prevents TNF-α-induced muscle atrophy via regulation of Akt/mTOR/FoxO1 signaling in C2C12 myotubes. Int Immunopharmacol. 2014;19(2):206-13.